`New generations of city officers will speak the language of games and they will play to plan their cities. We, the experts working for the city, need to adapt our methods to fit a new generation of policymakers and city makers that are born into a world that not only contains, but is reshaped by, the likes of Minecraft, Pokemon Go and Foursquare on a daily basis. Interactive maps, mixed realities, 3D environments, and multiplayer settings are the new mediums through which an entire generation perceives the urban world. Imagine a future where cities are modelled, tested, designed, and reshaped through interactive, collaborative games. At Play the City, we are working towards creating this future. This book therefore will inspire not only the city officers or experts in city making, as architects and planners, but anyone who feels interested and responsible for their living environments.` - Ekim Tan, founder Play the City Foundation A new book by Play the City. From Cape Town to Amsterdam to Istanbul, the book sheds light into the particular applications and outcomes of City Gaming in diverse planning and city making regimes worldwide. Following Ekim Tan`s PhD work on city gaming, this book has been designed to make her research more accessible to all. The book features a chapter dedicated to unravelling the city-gaming method as developed by the Play the City teams, with case studies from Shenzhen, Cape Town, Amsterdam, Almere and Istanbul. 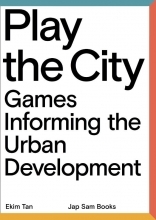 In addition to Play the City`s work, the book includes reviews of select influential city-games from around the world, and is enriched with personal interviews from gaming experts such as Eric Gordon, Pablo Suarez and Mohini Dutta. Born in Istanbul, Ekim Tan relocated to the Netherlands after having worked and studied in the United States, Syria and Egypt. Being trained as an architect, her growing interest and passion in cities and games led to a doctoral degree at the Delft University of Technology, titled `Negotiation and Design for the Self-organizing City: Gaming as a Method for Urban Design`. In 2008, Ekim Tan founded Play the City, an Amsterdam and Istanbul based city consultancy firm that helps governments and market parties effectively collaborate with stakeholders. Since developing the City Gaming method during her doctoral research at the Delft University of Technology, it has been applied in projects worldwide, among others, in Istanbul, Amsterdam, Tirana, Cape Town and Brussels. In her role at Play the City, Ekim Tan stays well-informed about the latest developments in societies and technologies worldwide. This helps Tan give the right direction to a young and growing firm. Meanwhile, she regularly travels to lecture and give trainings about cities and games; amongst which are Delft University of Technology, Aleppo University for Arts and Sciences, Rotterdam Architecture Academy, Amsterdam Architecture Academy, Copenhagen Business School, and Middle East Technical University.